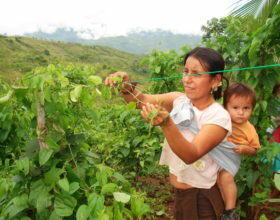 We work together with five cooperatives in Peru, where mostly women are responsible for the collection of Sacha Inchik. They collect the fruits and remove the seeds out. Resulting oil is pressed without heat, so as not to damage the fatty acids. From the seeds can also be ground gluten-free flour or prepared by roasting snacks. The demand is rising sharply each year. 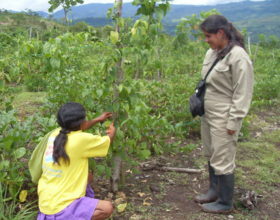 The cultivation of Sacha Inchik can thus displace the illegal cultivation of coca. The cultivation of Sacha Inchik is organized through cooperatives. 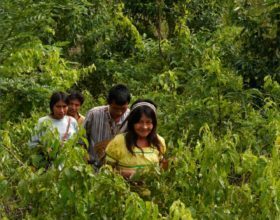 The trade is socially economically responsible organized (Fair Trade). 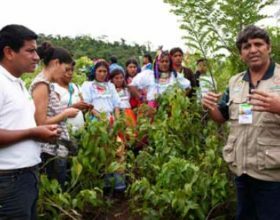 Our partner company in Peru maintains close relationships with producers committees in different parts of the province of Lamas, especially with the indigenous (Quechua-speaking) communities. In this way, it is working together with around 150 families in eight communities. The role of women is fundamentally important in this collaboration. They have the same participation in meetings with our partner company as the men. They also take part in all schools, internships and other activities, which are carried out by our partner company. They are also represented in all committees. In the region they ensure obtaining a high local value added with Sacha Inchik products. It should not – as for centuries for example with coffee or cocoa – come to economic exploitation of the South by the rich North. Consumers and producers are obliged to cooperate. Higher prices are making possible a regular life income in the growing area. Consumers in Europe and North America will benefit from a richer range of extremely health promoting agricultural products and potential product innovations.